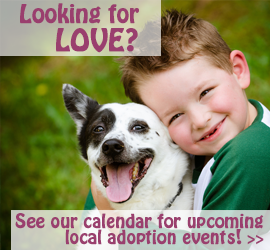 Volunteers from Providence Animal Center will be at Braxton’s on Sunday, July 10th from 12 -3 with sweet, adoptable animals. Cindy Baker and a team from Healing Touch for Animals will join them and demonstrate therapy techniques to calm the animals. Along with demonstrating the energy clearing techniques on the adoptables, Cindy and her team will work with any animals who may visit the store that day. So mark your calendars and be sure to stop by Braxton’s with your furry friend on Sunday, July 10th from 12-3 for some stress relieving tips and visit with great, adoptable animals from Providence Animal Center. The Providence Animal Center visits Braxton’s Animal Works on the second Sunday of each month. The Healing Touch For Animals team visits the Providence Adoption Center 1-2 times/month to do energy clearing on their shelter pets to help ease the stress of kennel life. For further info about what exactly HTA does, click here.